According to the combined horoscope Snake-Aries — an extraordinary man with a huge willpower. He does not build illusions and does not hover in the clouds, he prefers to act, not to reason. However, he is unhurried and extremely cautious, not in his rules to rely on someone’s opinion, to ask for help or advice. Aries-snake is distinguished by thoughtfulness, a serious attitude towards life: for him there are no insignificant trifles. Smart, judicious, always knows how best to do in a particular situation. Wise Snake gives its representatives the gift of foresight, which guarantees the success of all their undertakings. Actions of Aries-Snakes are always accurate and timely, they easily achieve the intended. Do not just skillfully plan your life, but also actively influence the destinies of other people. The purpose-oriented Aries-Snake does not limit himself in desires, he is able to reach any peaks. Discernment, caution, prudence are qualities that testify to his wisdom, his ability to distribute his powers competently. This person is not characterized by spontaneous, unpredictable behavior. Chaos and confusion — alien to the Snake-Aries element, his life reigns full order. The wisdom of the Snake knows no bounds, it directs the energy of Aries in the right direction. Therefore, all the actions of Aries-Snakes are clearly verified: it is not lazy to recheck the information several times, pay great attention to small things. Only after making sure of their own safety, makes one accurate throw — no unnecessary movements. Snake-Aries is an unpredictable person: it’s impossible to guess what’s on his mind. On the one hand — calm and complete confidence in their abilities, and on the other — sharp changes in mood. Sometimes, under the influence of emotions, Aries-Snake commits serious mistakes, which significantly complicate his life. In this case, one can not exclude the influence of an impulsive and stubborn Aries, who is accustomed to acting in accordance with his desires. Aries-Snake must learn to control himself, and even from time to time fall into a "hibernation". Quiet, calm atmosphere will allow him to slowly sort out all that is happening. Although there is a danger that Aries-Snake will finally become entangled in its conclusions and lose track of time. The main feature of the Snake-Aries sign is wisdom and charm. People of this combination are not so selfish as other Aries: they try to maintain good relations with all. Aries-Snake is always polite, attentive, rarely enters into disputes and conflicts. Shrewd and wise, knows how to give valuable advice, what causes boundless trust and respect. People know that Aries-Snake will find a way out of the most confusing situation. However, it is too practical to waste your energy in vain. Strives for luxury and wealth, very dependent on comfort. Aries-Snake is important to achieve material prosperity. He works a lot, does not need money, but is distinguished by avarice. Competently plans its budget, does not make spontaneous purchases. Aries-Snake is so perceptive that at the very beginning of the relationship he understands: it is necessary to continue acquaintance or it’s time to part. But he is not in a hurry to openly show his feelings: he is unruffled and with great dignity. The partner can only guess at the real state of things, and Aries-Snake will calmly watch his sufferings. He looks closely for a long time and carefully studies the object of his passion. He starts courting only after he has fully thought out the strategy of his behavior. Building a close, trusting relationship with Aries-Snake is quite difficult. His real feelings and thoughts are a mystery to the closest people. Aries-Snake is always calm, restrained: does not enter into disputes, avoids scandals and loud clarification of relations. According to the family horoscope, Aries-Snake — an attentive and caring partner, is not capable of betrayal and deception. True, in return waiting for love, even blind adoration: loved ones must take it with all the advantages and disadvantages. Men and women Snake-Aries are hardworking, purposeful, and most importantly — consistent. Most of all they are suitable for activities related to intellectual work: science, medicine, technical industries. These people have all the data to build a successful career. Aries-Snake chooses the kind of activity based on their own feelings, although the demand for the profession in the labor market is crucial. He should receive a decent reward for his work. At his workplace, Aries-Snake is a king and a god, only he has the right to make decisions. Colleagues will have to come to terms with his desire to control the work process and give directions. The high professionalism of the Aries-Snake is beyond doubt, so he readily obeys. Moreover, he is not disposed to unnecessary talk, he values his time too much. Aries-Snake aspires to career growth: he does not get tired to learn and improve his skills throughout his life. Do not spend your life on empty chores, but just doing business. Wise Aries-Snake man — personality remarkable and not ordinary. Endurance, cold calculation, the mind are the characteristic features of the representatives of this sign. They are distinguished by diligence, dedication, and skill in solving business issues, skill, ingenuity and iron grip. Therefore, they have a reputation of real professionals, they reach considerable career heights. 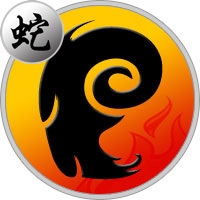 However, it is not worth writing off the quick temper, the impulsiveness of Aries. And this seasoned man is subject to doubt, hard experiencing personal setbacks. Therefore, in the affairs of love, she acts cautiously, looks at the woman for a long time. Aries-Snake is a sensible man, will not associate life with a frivolous partner. But having determined the choice, it becomes a faithful and loving spouse. Temperamental woman Aries-Snake finds the strength to keep emotions under control. Cleverly manipulates people, always takes the position that is beneficial at this point in time. Do not sacrifice their interests, even to please a close environment. An energetic, self-assured woman walks through life boldly, without exchanging trifles. It has a lot of advantages: a brilliant mind, attractive appearance, purposefulness. For men, she seems a passionate and unapproachable beauty. Aries-Snake woman is sharp and stubborn, waiting for a partner of adoration and worship. She prefers to solve all important issues singly, does not consider it necessary to listen to the opinion of the chosen one. But the relationship with her will never be insipid and boring.